At the base level, you'll get an engine that can put out 245 horsepower, but you can always upgrade that to the sDrive30i, which is a rear-wheel drive model that can get over 340 horsepower. It's amazing what you'll find from BMW in the latest lineup in terms of technology features. You can now get driver assistance features standard on the BMW X3, such as blind spot monitoring and parking assist. 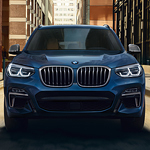 Want to test drive the all new BMW X3? Stop by Thompson BMW located in Doylestown.